Thank you to Zing™ Zero Calorie Stevia Sweetener and Her Campus Media for partnering on this post! School has been in session for a month now, so we are finally in a good routine. Homeschooling is a lot different than when the kids were in public school. My days are crazy busy until about 3 p.m., but our evenings are a lot less hectic because we don't have any homework or school projects to work on. It's nice to have evenings free, but did I mention how crazy the days are? When school is over for the day, I'm more than ready for a small break. The weather has been beautiful lately, so I've been spending my afternoons on the patio watching the kids ride their bikes or play with the chickens to unwind after school. That's where the inspiration for this peach iced tea recipe with Born Sweet™ Zing™ Zero Calorie Stevia Sweetener came from. I used to be a diet pop addict. I would drink at least three a day, usually more. Of course, I felt slugging and tired all of the time, so I switched to iced tea. For some reason, black tea makes me really jittery with the caffeine content, so I switched again to white tea with less caffeine. When our peaches came in this year, I thought they would be excellent in my white tea, and I was right. They give it an amazing flavor, so I froze some to use all winter. I used frozen peaches for this recipe, but you can use fresh peaches too. 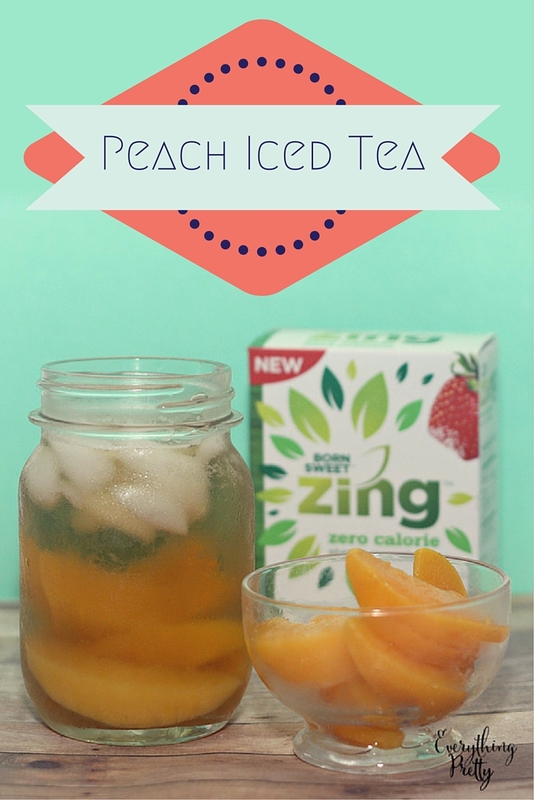 I like to keep my drinks zero calorie, so I use Zing™ Zero Calorie Stevia Sweetener to sweeten my peach iced tea recipe. Zing™ Zero Calorie Stevia Sweetener is a zero calorie sweetener that's made with stevia leaf extract, so it's made with real ingredients and nothing artifical. In a medium sauce pan, combine fresh or frozen peaches and two cups water. Bring to a boil and reduce heat and simmer for 15 minutes. Let cool to room temperature. In a separate medium sauce pan, bring two cups of water to just boiling. Remove from heat and let cool to 190 degrees. You don't have to use a thermometer for this, but it should stop bubbling for a few minutes. Add tea bags and let steep for 5 minutes. Let cool. Remove peaches from peach syrup. You can either add them to the bottom of your glass of tea or eat them. Fill a glass with ice and add equal parts white tea and peach syrup. Sprinkle with Zing™ Zero Calorie Stevia Sweetener to taste. Stir well and enjoy! This makes 4 cups of tea, but you could easily double or triple the recipe to make more for a crowd or to keep on hand. Since you mix it just before you drink it, store the tea and the peach syrup separately in the fridge and combine when you want a glass. I usually make what I'll drink in two days and don't keep it longer than than that. If you feel spunky, you can add other fruit to the syrup. Mango and most berries are really good too. Click here for a free sample of Zing™ Zero Calorie Stevia Sweetener to make this recipe yourself. Have you made flavored teas? What's your favorite flavor?